Ginger is well known for its potent antioxidants and they are really good for the body and skin. Think anti-aging! Besides having it for my afternoon tea, I love to use it for my bath especially before bedtime or during cold and wet weather when my body need that extra warmth. To make soothing ginger bath, you need a couple of ginger roots and some honey. Honey contains antioxidants, enzymes and anti-bacterial properties. Besides being used to treat hard-to-heal wounds, honey is super moisturising for skin. I use Manuka honey because I am also using it for my ginger tea. There are 4 common types of ginger, namely blue ginger, young ginger, old ginger and yellow ginger (turmeric). Blue ginger is said to contain the highest amount of antioxidants. For my tea and bath purposes, I use young ginger. You may also use old ginger but it is not advisable to use yellow ginger because it will stain your clothes and the white bathtub. Cleaning the stain thereafter will be a hassle! 1. Wash the ginger roots and slice them into pieces. 2. 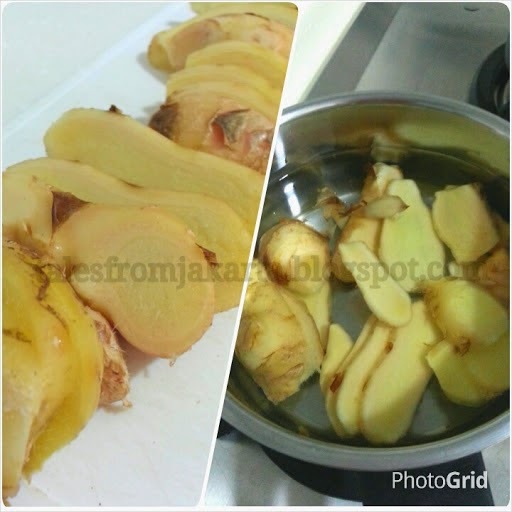 Boil the sliced ginger roots in a small pot for 5 minutes. 3. While waiting for the ginger water to boil, prepare the honey. Dilute 3 to 5 tablespoons of honey (depending on the size of your bathtub) into a cup of slightly warm water. Do not use hot water because it will destroy the enzymes of the honey. 4. Prepare the bath water (ideally warm to touch as hot bath tends to dry skin out) and pour the ginger water and honey into the bathtub. To test the water temperature, dip your elbow and upper arm into the bath water. Add cool water if it's too hot. Soak in and enjoy your warm ginger bath for 20 minutes.